Hours: 10am – 7pm. Closed Sunday. Carpet Mill Outlet offers the best selection and prices on a wide inventory of flooring choices. Colorado owned and operated by the Jensen family since 1974, Carpet Mill Outlet Flooring Stores is one of the best stores to shop carpet, hardwood, laminate, tile, stone, area rugs in Denver and more! We also carry COREtec® and WPC as well as eco-friendly flooring options in Arvada. Our Arvada location offers a vast range of styles and selections on flooring. Whether you tend to lean more contemporary, or you prefer a traditional look, we have something for you! We work efficiently to keep costs low, providing our loyal customers the best flooring deals! Adding or replacing the carpet and tiles in your home is a great option for those looking for more versatility, comfort, ease of maintenance, and health benefits over other flooring options. Another great reason to go with carpet is how budget-friendly it is without detracting from the overall look and feel of your space. Everyone has a unique style and budget, and Carpet Mill Outlet is here to help you find the perfect home or commercial carpet! We offer affordable carpet options, quality carpet cushions, and easy carpet installation services in Arvada, Denver. Follow Carpet Mill Outlet on Facebook for weekly carpet sale promotions, giveaways, and tips! Carpet Mill Outlet’s Arvada location is one the few retailers trusted to carry the STAINMASTER® carpet and flooring brand. STAINMASTER® carpets are designed for the way you live and offer easy-to-clean carpet and flooring in Arvada that is perfect for the busy family, those with furry friends, and those with an active lifestyle. Only deeply respected and quality stores are worthy of becoming a STAINMASTER FLOORING CENTER® showroom. 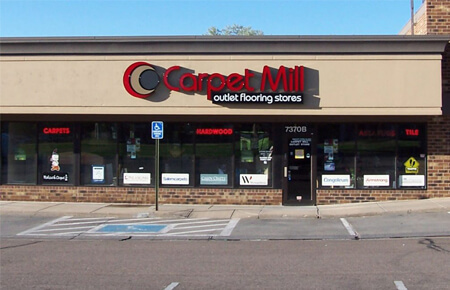 Carpet Mill Outlet in Arvada is one of these recommended retailers and has a commitment to treat shoppers like you with the utmost respect and provide the highest quality in service offering the best floor décor options in Arvada. Swing by our showroom today to find your perfect STAINMASTER® carpet or flooring. Stop by our Arvada location today to find the right carpet or other flooring option for your home or business. We carry a wide variety of options that can fit any budget!